CREF: Hello, Maaike, could you introduce yourself, please? 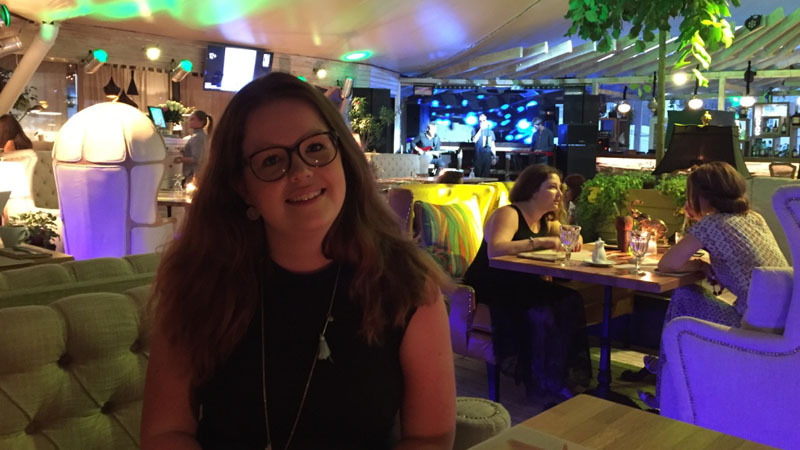 Maaike: Hello, I am from Holland, I study Political Sciences at the university of Leyden. CREF: Is this your first time in Moscow? How do you like the city? Maaike: Yes, it is my first time in Moscow, and in Russia as well! Moscow is an amazing city. Wherever I go, I am surprised at its beauty. There are many places of interest, alongside touristic sites like Red Square and the Kremlin, and each time I take a walk to discover the city, I stumble upon a new, beautiful and big place that I hadn’t heard of before. I visited many places, museums, attractions, I even had the opportunity to attend a rooftop concert, thanks to my father’s contacts! CREF: Why did you chose to study Russian? Maaike: During my studies my interest in Russia and international relations with Russia grew and there was a moment when I pondered the possibility of learning the language, to better understand the country, and maybe find some work in that field in Russia. My father has been here several times and that encouraged me to go ahead and come to this unknown country and study Russian. I took an intensive course at CREF, 30 hours a week. CREF: Where do you live? Maaike: I live in the center, near Pushkinskaya subway station. I chose to live with a Russian family, because I wanted to be able to practice while I am not at CREF. I have two roommates who also study at CREF, and that helps in adapting oneself to a new country. CREF: Do you have a lot of homework? Maaike: No, I have 30 hours a day, from 10 to 15:30 pm, my professor is Pavel, so I review what I have learned that day, but I don’t have a lot of homework, because it is already quite intensive. Pavel is very nice, we laugh a lot, but we also work! He tells me about the way of living here, what is common here, in Russia. Of course, we work hard to learn the language as well! CREF: How would you describe your impression, at the end of the intensive session? Maaike: It was great learning with Pavel and in Russia. Pavel, along with the language, told me a lot of things about everyday life, and typical Russian things. This is very valuable and I don’t think I would have found that back in Holland. I was a real beginner when I arrived, and now, I just passed the tests after three weeks, and I am glad to say I have the level A1! This trip has been an amazing experience; I learned a lot, including about myself, while living on my own in a country whose language I am learning. CREF: What advice would you give to someone who wants to study Russian? Maaike: If that person has some doubts, like I did, I would say : go ahead, just do it! It is worthwhile. Congratulations with your Russian tests, we hope you will come back to Russia and achieve your goals!